FULL DISCLOSURE: bon appétit magazine had this recipe a long time ago...and I REALLY wanted to make it but sadly, never did so. Until today. HOLY MACKEREL! This dish, when I first saw it, made me SO excited....it sounds delicious, looks beautiful, and has amazing ingredients. What can go wrong? Generally a lot of things. Our eyes ARE always bigger than our stomachs. In this case, I wish my eyes were a BIT bigger...this dish is so delicious, that the portions I offered to myself were way too small. The ingredients are pretty standard of North African dishes - the spices, the pistachios, and the pomegranates. 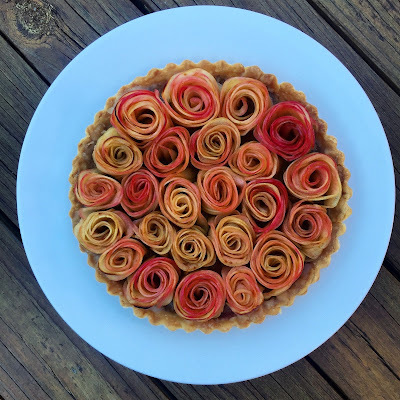 All things that add a certain "je ne sais quoi" to dishes. Beyond that, we all know that I have a strong affinity towards North African cuisine - Tunisian, Moroccan, Algerian, you name it. I can imagine this "stir-fry" would make a stellar partner to couscous! On to the recipe - fortunately, it's that time of year where lamb is king. Springtime, Easter-time-ish, all that fun stuff. I know, Easter is a month away, but us cooks have to practice and prepare! Acquiring pomegranate is questionable since it is more of a seasonal item, but these days you shouldn't have trouble - especially just the seeds. This recipe is EXTREMELY easy, and quite frankly foolproof. You don't even have to be a lamb lover to get excited about this dish! First, prepare the spice rub. Toast the cumin and coriander seeds in a small pan until fragrant - be careful not to let them burn, which happens quickly! 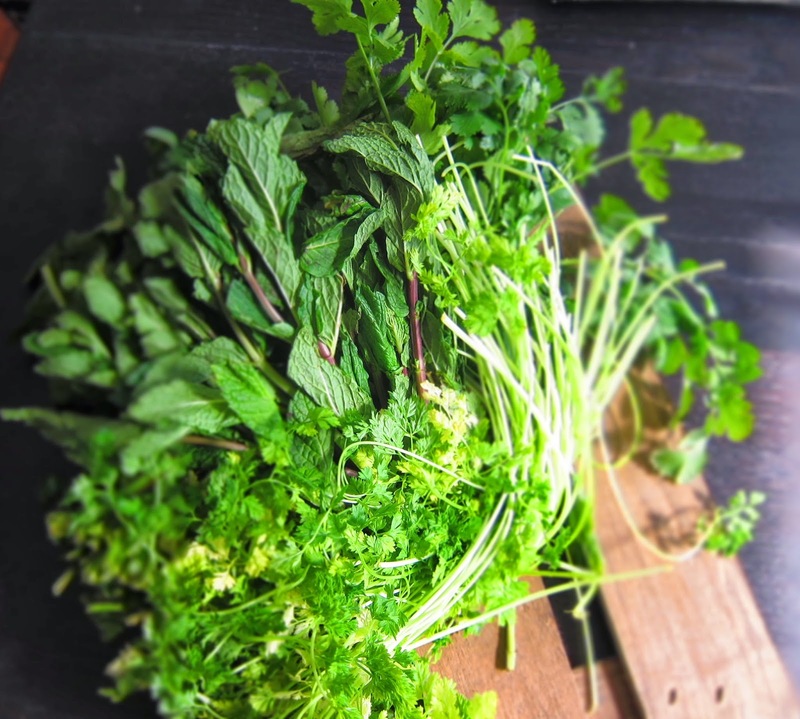 Once they are nicely toasted, place them in a mortar and pestle and grind away. It doesn't have to be the finest powder, but fine enough to stick and coat the lamb pieces. 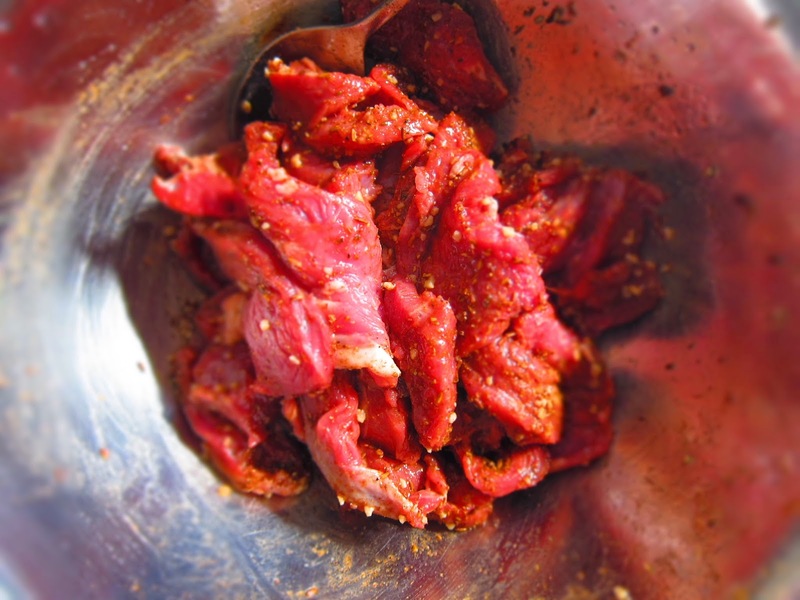 In a large bowl, combine the lamb, cumin, coriander, paprika, garlic, vinegar, and 2 T of oil. Add about 1 teaspoon of salt and a few grinds of pepper. Toss to combine and let chill for at least 15 minutes, if not longer. The longer the better! When you're ready to cook, heat 2 T oil in a large cast iron pan until hot. Depending how big your pan is, you may have to cook in batches, but if you have a behemoth of a cast iron pan, you can do it all in one fell swoop. Cook the lamb, stirring occasionally, until browned - about 5 minutes. Transfer to a plate/or bowl and set aside. Add the red onion to the skillet and cook, stirring often, until they become just tender. Add 1/2 C water, season with a bit of salt and pepper, and cook until the water is evaporated. Be sure to stir often and scrape up any bits that were left on the pan from the lamb. When the water has just evaporated, add the lamb back in and toss to combine. Heat through, and season to taste. While the onions/lamb are cooking, stir the Greek yogurt with about 2 T water, and season with salt and pepper. To plate, divide the stir-fry mixture amongst 4 plates or bowls. 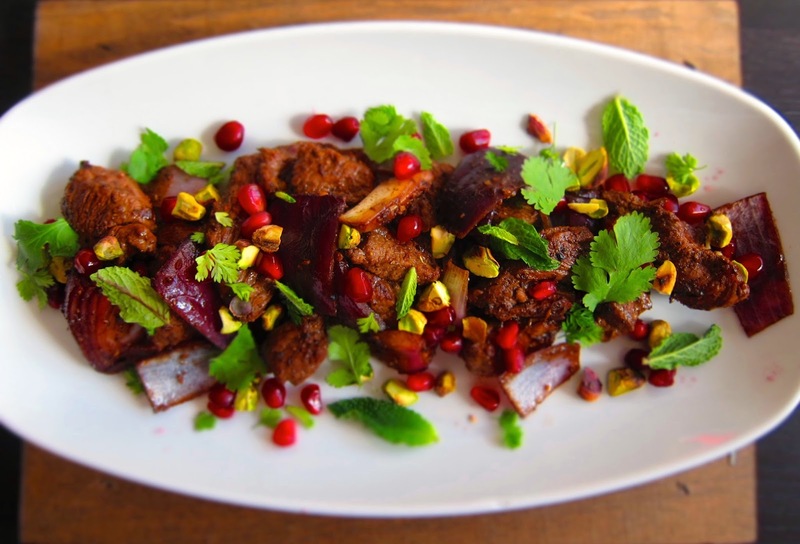 Scatter the pomegranate seeds and pistachios all around (don't be light handed here! 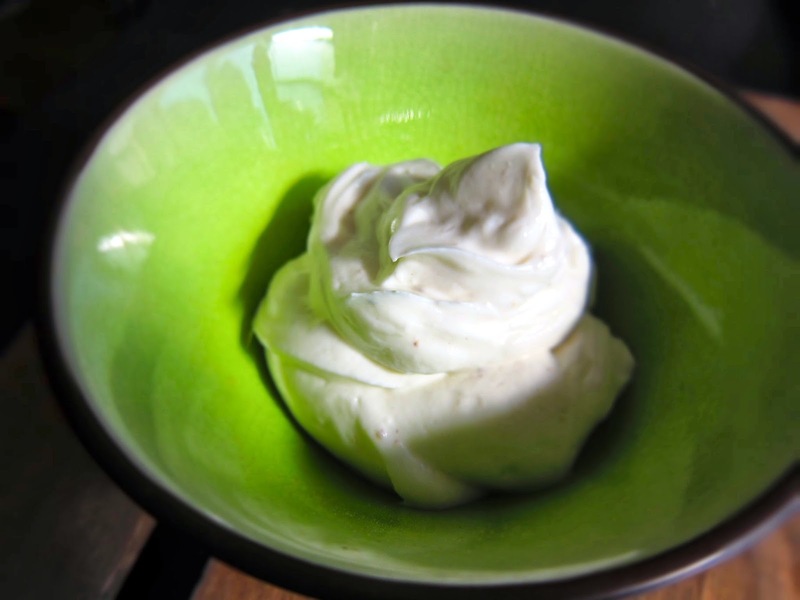 ), and finish with a scattering of all the herbs and a dollop of yogurt. Grab a fork and dig in! Although there are seemingly a lot of components to this dish, they all combine harmoniously. 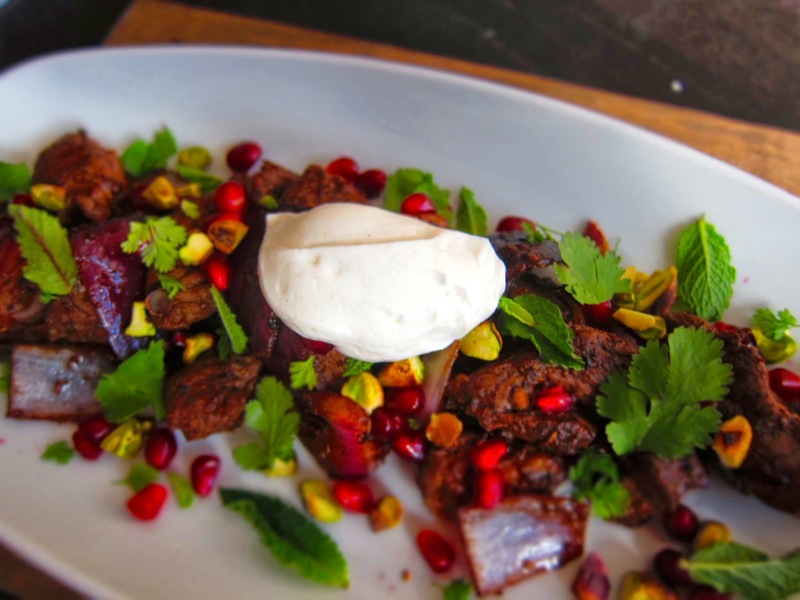 The pomegranate seeds add a nice refreshing pop, along with the fresh flavor of the herbs and yogurt - they really play well with the deep spices of the lamb. All together, they are DELICIOUS! This dish was devoured by friends, employees, and significant others within about a millisecond. Sadly, I did not have an entire lamb to cook, but it's so popular that that may have to be the case! Definitely a recipe for the ages! I never thought I would ever buy the idea of making lamb in any form. 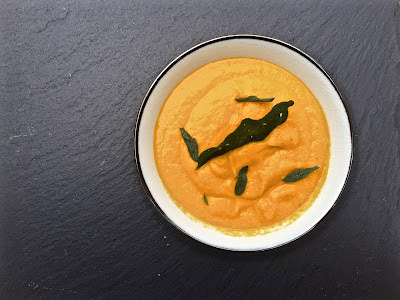 But I must admitt that this recipe looks tempting and I am really planning to try this one and I am sure it will taste great.